16-year-old Emily Perez is a sophomore at Lincoln High School in Tallahassee. 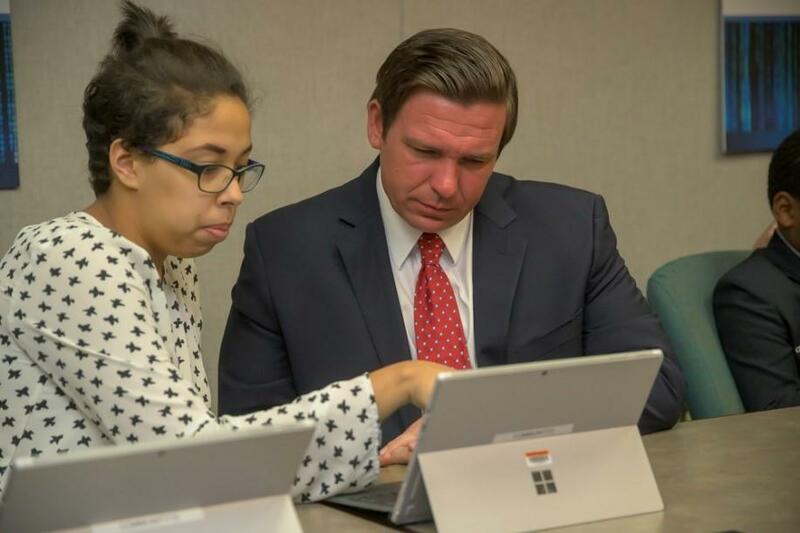 She shows Governor Ron DeSantis her work during Coding Day at the capitol. Coding is also known as computer programming. It refers to lines of code that contain instructions for everything from websites to video games to cars. Sen. Manny Diaz (R-Hialeah Gardens) chairs the Senate education committee and has a background as a teacher and school administrator. He says kids are intuitively able to understand coding, but they need adults who can teach them. Gov. Ron DeSantis says he’s ready to put up the money for teacher training. His proposed budget includes the creation of a program to pay for training and bonuses for teachers who pursue certifications in computer science. DeSantis wants Florida to lead the way. His administration is promoting the importance of workforce education and technical skills. He’s also calling for computer science to count as a science credit toward high school graduation. Computer Coding is the new must-know skill businesses and states are hanging their economic futures on. Throughout the summer, Florida students from kindergarten through 12th grade participated in camps geared toward helping them learn computer languages. Some will continue this learning throughout the fall. But while kids learn sequences and symbols, they need other lessons beyond technical skills to get ready for a diverse work world. Computer coders have found a champion in Florida Senator Jeremy Ring. Ring, a former yahoo executive, believes coding is an art, rather than a science. He’s putting forth an idea to allow Florida students to choose coding in order to fulfill a foreign language requirement for college. Senator Jeremy Ring of Margate wants to allow high schools to give foreign language credit for computer coding classes. Former Yahoo exec Jeremy Ring helped build the modern tech landscape. Now the Florida Senator wants high schools to teach computer coding. The Florida House is considering allowing students to take a computer coding course to fulfill credit requirement in lieu of a foreign language. The Bill was amended before voted on.